Listen folks, I will tell you in the stilted but ultimately American phrasing used by the online identity I assume for situations just like these, that New Mexico is a weird place and misunderstood, too. We are still on the fringe of things. Even amidst a diverse collection of Latin American cultures all around (less so the farther en el norte one ventures, I hear tell). I sometimes feel that we all have more in common with Mars, than with Mexico, Califas, Tejas or the aforementioned mysteriously mountainous and cold world that begins above Raton. Certainly New Mexican culture is not easily accounted for or well understood outside the boundaries of our state. As an example of the poor vagaries that predominate media coverage of New Mexico, I offer the following. The Californio who produces Ask a Mexican, Gustavo Arellano, wrote this past week that New Mexican food is unique because "it dates back to the days of the Spanish Conquistadors" and specifically that, "... You're not going to find much chile and yellow cheese in New Mexico ..."
So either that comida I've been counting on for so long is really old or I am totally missing something. Wasn't all Latino food in the US ultimately influenced by "the days of the Spanish Conquistadors"? Gustavo, dude, I see your point when I think about quilites or torta de huevo, but when I stared down my enchilada plate tonight, I am damn sure it said something about Mexico, something about corn tortillas; the tamales were muttering something too, and I think it was in the ceremonial version of Nahuatl. I'm not even going to get into the chile and cheese component of Arellano's memorable proclamations. Let's just say that the elusive substance called New Mexican food is really a combination of several diverse regional and historical food preparation processes, not some unchanged (and by implication, rare and exotic) past form. But I digress. 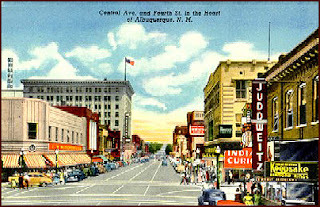 Anyway, the fact that I am writing to you tonight in English is one mighty proof of the oddity of New Mexico. That I have learnt to work magic by that same process is more an anomaly than part of a pattern, but it does reflect a vast and ultimately icky cultural tendency that was acted out by my parents' generation and is occasionally invoked by some Gen Xers. My family is from here. My father's first language was Spanish, though he was proficient in English by age 6. My mother's family spoke Spanish too, but some of them spoke German. Both of them were college educated and came from families where education, books and the arts were important expressions of culture and self. There was a rich tapestry of other languages and cultures at our disposal. To complicate matters, my father took a job on the Navajo Reservation in the late 1960s and had to learn the rudiments of the language in order to do his job. My mother drove us into town, to the library, frequently. We borrowed every sort of book, but my favorites were the dictionaries, the books that had diagrams of different human alphabets contained as a matter of course. But my parents were overly concerned with fitting in, with assuming the mantle of the bourgeois, with being recognized as Americans. And so they were good at hiding things. They spoke English in public and in most social situations. And mostly they passed. When they did not, people at meetings and parties would end up asking my mother and father where they were from, because the way they talked made it seem like they could be from anywhere at all. My mother often joked about that. She told folks who asked after their fluctuating identity that the Carrillo family was from Siberia. At home, my mother and father spoke to each other in an exasperating mix of the languages mentioned above, but mostly in a passionate and idiosyncratic form of Spanglish that was both comical and poignant to the ear. They made no overt efforts to teach us any other language than English and they demanded that we excel in its use. They never said that we should not learn or use the languages of our ancestors and advised us to respect those who did. I believe they had faith that multilingualism would come to us after they passed, as a reward for embracing America. So, I gotta tell you I think all of this stuff about Whole Foods Market is rubbish, by my accounting. A fear of other languages or cultures that results from some corporate vision of American exceptionalism is no less loathsome than the self-denial foisted off on my parents' generation as a necessity of assimilation. Such policies come from a place that does not value New Mexican culture and probably has no intention of valuing it in the future. Much like the folks who wanted to sell Native American-themed underwear or who write to tell America of our arcane and Oriental linkage to Spanish Conquistadors, they just don't get it. I didn't learn to speak and write Spanish until after college, when I traveled to South America. My Spanish will always be mediocre. My knowledge of German, much like my knowledge of my mother's cultural identity, remains inchoate. Sometimes I stay up late at night and listen to the Navajo Nation radio station through the interwebz and sort of understand every third sentence.